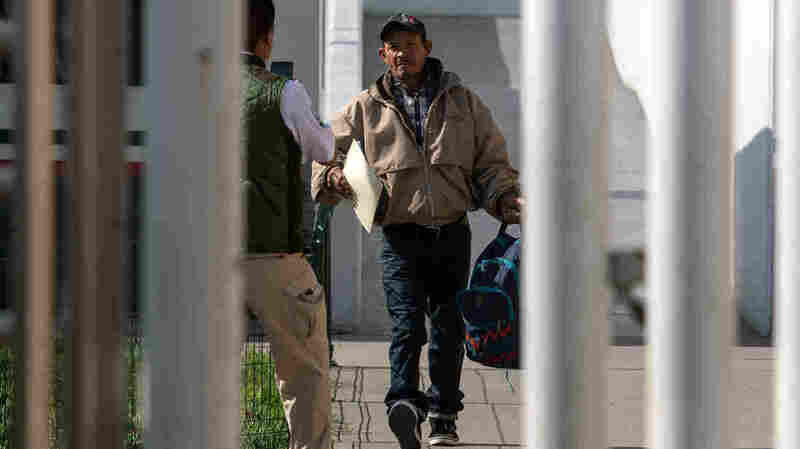 Trump Administration Begins 'Remain In Mexico' Policy, Sending Asylum-Seekers Back The new procedure is designed to prevent applicants from remaining in the U.S. while they await a hearing before an immigration judge. Carlos Catarlo Gomez, an asylum-seeker from Honduras, returns to Mexico from the United States while his case is processed. He was the first person returned under a new U.S. policy being called Remain in Mexico. The first asylum-seeker to be returned to Mexico was a Honduran man identified as Carlos Catarlo Gomez. He appeared confused and scared by the throng of reporters waiting for him Tuesday on the Mexican side of the San Ysidro border crossing, according to the San Diego Union-Tribune. He was whisked away by Mexican authorities. Officially dubbed "Migrant Protection Protocols," the policy was announced by Homeland Security Secretary Kirstjen Nielsen last December. Administration officials initially called it a "Remain in Mexico" policy to deter the waves of asylum-seeking families fleeing mainly the Northern Triangle nations of Guatemala, El Salvador and Honduras. Until now, asylum-seekers were allowed to remain in the U.S., pending their immigration court appearances. There is a backlog of 800,000 cases piled up in U.S. immigration courts. The number of migrants detained at the border is near its lowest level in decades, even as the number of asylum-seekers has doubled since 2015. Once the program gets underway, about 20 asylum-seekers will be returned to Mexico each day, reports Jean Guerrero of NPR member station KPBS. Nielsen was at the border crossing Tuesday, but she made no public remarks.